Darien police are participating in an enforcement program for distracted driving, including in particular drivers on cell phones while they’re driving. The program starts on Wednesday, Aug. 1, Police Chief Ray Osborne said. 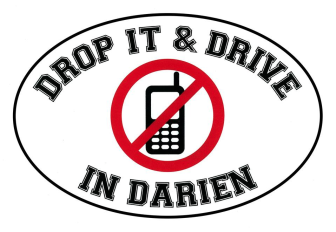 Darien has had its own campaign to reduce distracted driving, focusing on cell phone use. “We’ll have extra officers on patrol looking for cell phone violations,” Osborne said at a recent Police Commission meeting. The enforcement campaign will run for two weeks. At the Board of Selectmen’s meeting with town government department heads last Tuesday, Osborne said his department applied for and received a state Department of Transportation grant to pay police officers to conduct extra patrols for distracted driving violations. “So don’t talk on your cell phone,” he said. The audience laughed. Osborne replied: “I see it all the time. Disturbing. Causes accidents. The Police Department typically makes an announcement about stepped-up enforcement campaigns just before they start.